This is the graphic history of the 2001 Cincinnati riots, told for the first time from the perspective of the participants. When Timothy Thomas, a 19-year-old black man, was fatally shot by police, the city broke out into nonviolent civil disobedience that was met with further police violence. This was the first major uprising of the 21st Century, matched only by the LA riots a decade before and the protests in Ferguson over a decade later. Author and illustrator Dan Méndez Moore was 17 at the time when he participated in the six days of protests that shook the city between Thomas's death and his funeral. Méndez Moore's comics-journalism account sensitively captures a fiery moment in U.S. history through interviews with protestors, community leaders, bystanders, and a frustrated looter. He portrays the tension of a city boiling over, political leaders taking advantage, and an inner-city community coming together. 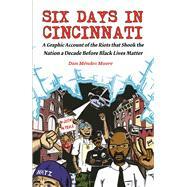 Six Days in Cincinnati is an all-American story of systemic racism and the power of popular movements, more relevant today than ever before. Dan Méndez Moore was born and raised in Cincinnati and received his bachelor’s degree in Urban Studies at Portland State University. He first got involved in social justice organizing during high school, when he founded the Cincinnati Radical Youth, and has never stopped. He currently works organizing low-wage workers at SEIU Local 26 in Minneapolis, MN. His comics have been published in Labor Notes and Cincinnati Street Vibes and he has a series of comics used as popular education tools for low-wage workers fighting for change.